If you’re looking to create a dynamic and memorable venue for your event then our medium stretch tent hire is the solution for you. By far our most popular stretch tent size, these tents hold between 80-200 people dining, or up to 250 standing. They are perfect for private parties, weddings, product launches, brand activations and any small gathering that needs a beautiful tent solution. It can also be ideal as an extension to an entertainment space. Like nearly all of our tents, they can be rigged off walls and buildings to create a canopied area where traditional structures cannot. Our medium stretch tents are incredibly popular, as they provide ideal cover for various medium-sized private or corporate events. The most popular size is the 10m x 15m stretch, however, our mid-range stretch tent sizes are available from 10m x 10 meters, up to around 18m x 15m. Available in a variety of colours, including white, chino (tan), platinum, black and yellow. Here at CGSM we have an experienced and professional crew. They’ll arrive on time and work hard to erect your stretch tent quickly and efficiently. A medium sized stretch tent will take approximately 3 hours to set up and 1 hour to dismantle. The exact timings will depend on your venue and will be discussed with you when we give you your quote. 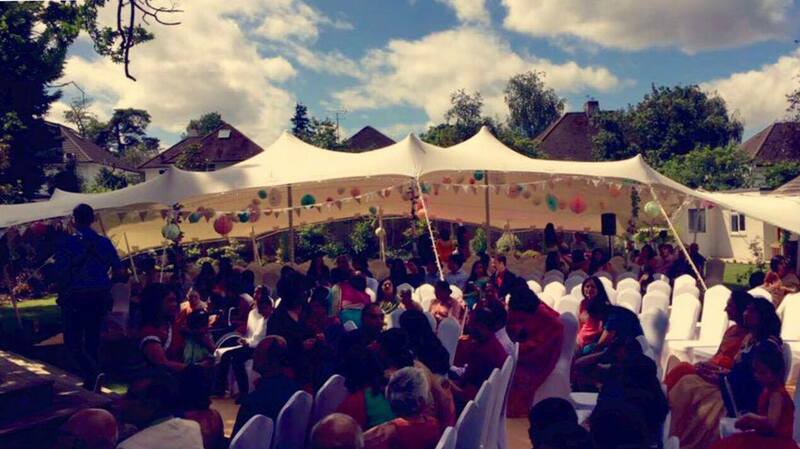 To get a quote for your stretch tent hire please click here to get in touch. One of our experienced team members will be happy to help you. Need Something A Little Bigger or Smaller?